Lou Rudinski's work features various woods from cherry, ash and maple to Wye Oak and English walnut, in the form of pens, bowls, salt and pepper mills, Ikebana and more. 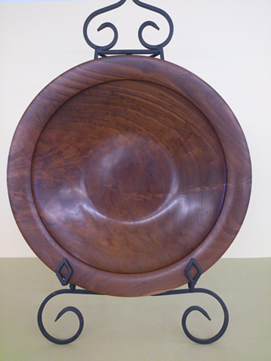 Lou is the vice president of Chesapeake Woodturners and has been turning wood for more than thirteen years. Have you heard of Sapele Wood? Used for acoustic guitars, this exotic African wood (in the mahogany family) becomes a 'work of art' in the hands of Master woodturner, Lou Rudinski. Come enjoy the current exhibit of new woodturning at Benfield Gallery. Limited edition pens made from the Wye Oak, English Walnut bowls, and Ash salad bowls are on exhibit. If Lou happens to be in the gallery bringing his latest creations he is happy to talk about his favorite types of woods and what he is planning to create.